Reigning World footballer of the year Lionel Messi and his teammate Andres Iniesta have cancelled their flights to Turkey following the failed military coup in the country. The pair were scheduled to join other football stars play a match in Turkey today Saturday July 16th that was organised by Samuel Eto'o, their former teammate, to commemorate the 10th anniversary of his charity foundation. However, the match has been cancelled after a military coup was attempted in Turkey late Friday night. 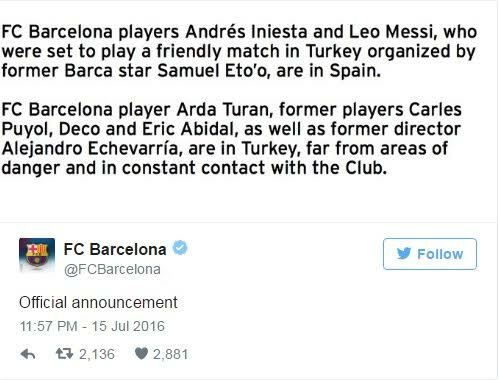 Barcelona football club posted a Tweet confirming both players were in Spain and wouldn't be traveling to Turkey for the match. 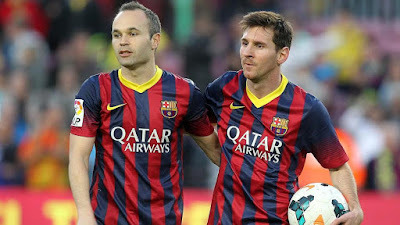 Messi, Neymar, Luis Suarez, Eden Hazard, Francesco Totti, Michael Essien, Xavi Hernandez, Carles Puyol, Eric Abidal, Jay Jay Okocha, Pierre Emerick Aubameyang, Andres Iniesta, Demba Ba, Didier Drogba and Arda Turan were all expected to take part in the game.